The goal of this project is to produce a multimedia documentation, including a video and smart book, of the lexical signs of the endangered indigenous Nigerian Sign Language (NSL). Lexical signs will focus on vocabulary from various aspects of Nigerian life and culture, such as family, food, cooking, farming, animals, etc. The signs will be augmented with a collection of free social discourse between individuals who use NSL to communicate. This will serve as a guide for how the language works structurally, and how the NSL lexical items interact in phrasal and sentence formation. In this project, we will video-record indigenous Nigerian Sign Language used in Abuja Deaf Center, which we believe represents the different dialects of the language. Deaf signers of NSL found in Abuja Deaf Center make up to 15% members of that community, who migrated from the different regions of the country, where they must have acquired the local signs. We will do a complementary recording in Kaduna in the core Northern State, and in Ibadan in the Southwest, both of which have a significant deaf population. We will adopt and adapt the modified Swadesh Wordlist version to record a corpus of indigenous signs, targeting up to 7600 words and expressions. We will annotate the video and the metadata for online upload and archive. We will create a user-friendly signed language app that will work in both large and small devices including personal computers, tablets, and smartphones, and we will upload several short videos on YouTube with open access. For distribution to deaf individuals, families, and deaf schools, especially in the rural areas with no internet, we will replicate the software app unto hundreds of regular SD cards for phones and tablets, burn several CD and DVD plates for Schools for the Deaf across the country, and Special Education Units of Ministries of Education. We have collaborative relationships and ongoing sensitization forums with families, schools for the Deaf, Ministries of Education, and the Nigerian National Association of the Deaf (NNAD). We will leverage on the existing relationships with the above-mentioned stakeholders to intensify sensitization on the need to teach deaf children in their own indigenous signs. With our proposed Early Intervention Program in place, our deaf and hearing volunteers that can sign will work with families that have newly diagnosed deaf children to teach the deaf infants in the indigenous Sign Language. our volunteer team will ensure the distribution of the SD cards to all the Schools for the Deaf in the country. We are currently compiling a list of the schools for online publication. 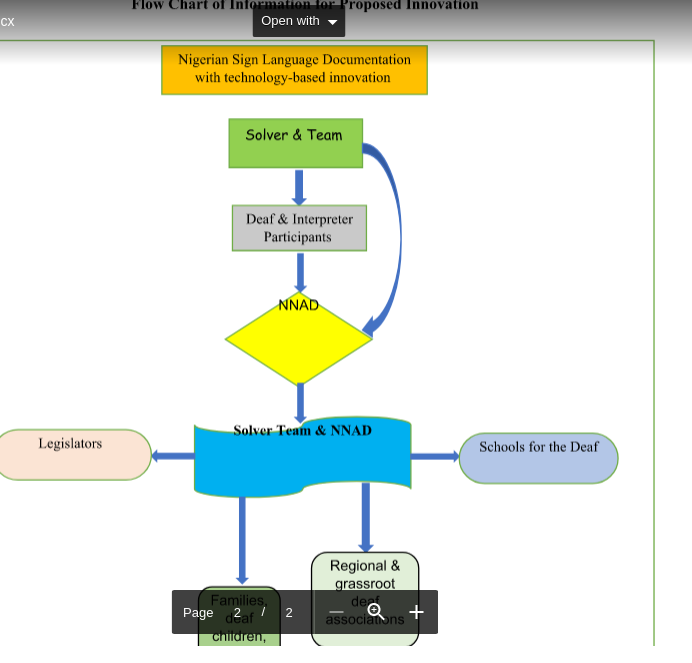 In summary, this project will document lexical signs of the endangered indigenous Nigerian Sign Language (NSL) within a Deaf community in Abuja with a representation of the various regional dialects. Socio-cultural expressions, including free discourse, Deaf proverbs and experiential stories will also be documented and will serve as a guide for understanding how NSL works structurally. The community consists of 97 Deaf adults plus hearing family members, most of whom use a form of English sign as learned in school. Only 15% are literate in NSL. We will also record deaf adults in other parts of the country who are found to use indigenous signed language.